I was heartened to read about the work of Kenya’s Professor Mary Abukutsa-Onyango on preserving and promoting the cultivation of indigenous crops. Many of the plants and vegetables that were spurned by the well fed as food for the poor are making a return and are to be found in Kenya’s supermarkets and restaurants. I was also saddened to learn that the father of the Green Revolution, Norman Borlaug, died last week. Borlaug decades long passion for tackling starvation has been matched by that of Professor Mary Abukutsa-Onyango. He, like Professor Abukutsa-Onyango, was a plant scientist. He had seen the Misissippi Dustbowl which many believed was caused through technological farming. Borlaug thought the problem was due to too little technology and that high yield drought resistant crops could prevent future dustbowls. In 1948 at the behest of the Rockefeller Institute Borlaug was requested to help poor farmers in Mexico. The Rockefellers had many interests in the country and the country was seething with revolutionary fervour because people were hungry. When he arrived in Mexico Borlaug despaired. Yields were low, crops had been ravaged by disease and the soil had been depleted. Over time he developed a stout strain of wheat which grew quickly and helped avert a food crisis. An essential element to the high yields was the use of chemical fertilizers and chemical pesticides. By 1953 Borlaug had developed over 40 varieties of wheat that were drought and disease resistant. On a small patch of land he had been able to triple and quadruple the amount of wheat that could be grown. By the 1960’s Mexico’s wheat output had outstripped that of the 1940’s sixfold, turning Mexico into a country self-sufficient in producing cereal grains. Seeing what was possible Borlaug began to argue that what was good for Mexico could be good for Africa and Asia. This was seen as controversial as it meant replacing indigenous crops with western wheat. In 1961 with funding from the Rockefeller Institute and the Ford Foundation Borlaug established the International Rice Research Institute for Rice in the Phillipines and turned his attention to rice. The risk of famine was now threatening the Asian sub-continent as population was outstripping food production. Borlaug’s initial attempts to persuade the Indian and Pakistani government to adopt his wheat varieties initially fell on deaf ears. The countries were bitterly divided and still at war with each other. But as a food famine loomed they soon came around and asked Borlaug for his advice. Before long they were shipping in his Mexican seed varieties by the ton. Asian scientists began testing his wheat varieties and found they did exceptionally well. Farmers were also given aid in the form of fertilizers and by 1968 Pakistan had become self-sufficient in wheat and India followed a few years later. India had such a surplus of wheat it was having to turn schools into temporary granaries. By the 1980’s India had turned into a net exporter of wheat. The same thing was repeated in the Phillipines as farmers switched to Borlaug’s dwarf varieties. Then China followed and today it is the world’s largest producer of food. What Borlaug achieved was considered to be nothing short of a miracle and was soon dubbed the “Green Revolution”. I was a young development worker in the Mekong Delta in 1968 when this new “miracle rice” from the Philippines arrived. Its impact in the eight villages in which I worked was as stunning as it was immediate. The four villages that were accessible by road experienced dramatic improvements, both in terms of nutrition and the well being of the people. New IR-8 rice spread rapidly as peasant farmers with small plots were suddenly able to experience both increased yields and double crops. This in turn led to tangible improvements in the quality of life: child mortality dropped; malnutrition abated; and children, especially girls, stayed in school longer. At the same time, there was a rapid corresponding decrease in the level of armed conflict and military hostilities. It was as though the combination of new roads and new rice seed caused the roots of violent extremism to wither and disappear in a way that military action alone could not. By contrast, the four other villages, with no bridges and no road access, remained mired in poverty: the new “miracle seeds” were not put to use; children remained stunted; and warfare and political dissidence continued there unabated. In 1970 he was honoured for his work and awarded the nobel peace prize. He is credited with saving the lives of a billion people through creating rice and wheat hybrids which everywhere, save for Africa, were responsible for increasing food production faster than the rate of population growth. But it was this success at saving lives that led to a backlash by Malthussian environmentalists who saw population growth as the biggest threat to the earth’s ecosystems. Borlaug too was a neo-Malthussian who believed the world was overpopulated, once saying that feeding the starving was only feeding “the population monster” and he had wanted to see governments tackle population by lowering birth rates. In his Nobel acceptance speech he said, “There can be no permanent progress in the battle against hunger until the agencies that fight for increased food production and those that fight for population control unite in a common effort.” Further he argued that introducing hybrid varieties to Africa would save its wild habitats because hybrid varieties could produce higher yields on less land thus preserving Africa’s wild habitats from “slash and burn” subsistence agriculture. By the time Borlaug had begun work in Africa in the 1980’s environmental lobbyists had succeeded in persuading the World Bank and Ford Foundation to stop funding most of his African agricultural projects. The Rockefeller Institute also shied away from supporting him as it now began to concentrate on bio-technology. It was argued that tractors and intensive farming methods had no place in Africa. Borlaug’s methods had created dependence on monoculture crops, unsustainable farming practices, heavy indebtedness among subsistence farmers, and high levels of cancer among those who work with agriculture chemicals. Today environmentalists also express doubts about the long-term sustainability of farming practices encouraged by the Green Revolution in both the developed and the developing world. Borlaug found his work hampered in Africa by poor transportation systems. He complained “The potential’s there, but you can’t eat potential. The transport system is miserable. We have to bring in fertilizer. 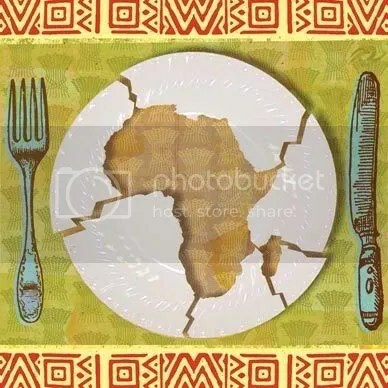 And as soon as you get these little farms producing, there has to be better transport to move the excess green to the cities of those countries where there are food shortages.” Equally factors such as irrigation systems and organized economies that had led to success in Asia were lacking in Africa. Most of Borlaug’s work tended to be concentrated in the developed parts of Africa and where they were implemented yields increased. So far so good. The conventional wisdom about world hunger is that there is not enough food to feed everybody so we must grow more. Yet globally food yields have risen since Borlaug began his work in the 1940’s and there is more than enough food to feed the world’s population. 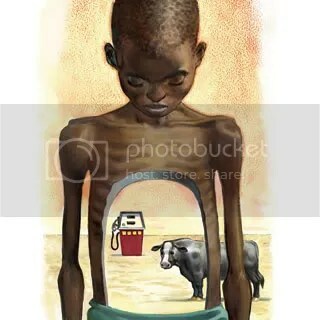 Global hunger’s cause is therefore not one of production but distribution. Global production rose by 11% since the 1970’s but much of that transformation happened within China. Subtract China from the equation and global hunger rose by 11%. In South America, hunger grew by nearly 20 percent despite impressive gains in output driven, in part, by improved crop varieties. Those varieties required large landholdings in order to be economically efficient, which meant that the peasants working that land had to be kicked off. Those displaced peasants migrated to the hillsides and tropical forests, doubling the area of cultivated land–in other words, the increase in food came not only through technology but also simply by having food growing on a greater area. Hallelujah! A landmark trial has ended with British firm Mabey and Johnson being convicted of bribing foreign officials. The firm admitted to paying bribes to officials around the world to win contracts. This trial is the first of its kind and more are expected to follow. Mabey and Johnson builds bridges and many of its contracts were subsidised by British taxpayers. The firm is expected to pay out more than £6.5 million to foreign governments as fines and reparations. Today, at Southwark crown court, London, John Hardy QC for the SFO, revealed the names of 12 individuals in six countries alleged to have received bribes from the Reading-based Mabey and Johnson. He said the company paid “a wide-ranging series of bribes” totalling £470,000 to politicians and officials in Ghana. He identified five who travelled to Britain to collect sums of money from £10,000 to £55,000 from bank accounts in London and Watford. Ministers and officials in Angola, Madagascar, Mozambique, Bangladesh, and Jamaica were also bribed, Hardy told the court. Hardy said that over eight years, the firm gave £100,000 “to buy the favours” of Joseph Hibbert, a key Jamaican official in awarding contracts, one of them worth £14m. The court was told how the firm, owned by one of Britain’s richest families, paid bribes totalling £1m to foreign politicians and officials to get export orders valued at £60m to £70m through covert middlemen. The Mabey family built up a fortune of more than £200m by selling steel bridges internationally. The UK Serious Fraud squad is now eyeing BAE which will open a massive can of worms should it go ahead. I wait with baited breath. In 1942, a lengthy evaluation of Haussmann’s efforts appeared in Architectural Forum. It documented in detail what he had done, attempted an analysis of his mistakes but sought to recuperate his reputation as one of the greatest urbanists of all time. The article was by none other than Robert Moses, who after the Second World War did to New York what Haussmann had done to Paris. That is, Moses changed the scale of thinking about the urban process. Through a system of highways and infrastructural transformations, suburbanization and the total re-engineering of not just the city but also the whole metropolitan region, he helped resolve the capital-surplus absorption problem. To do this, he tapped into new financial institutions and tax arrangements that liberated the credit to debt-finance urban expansion. When taken nationwide to all the major metropolitan centres of the us—yet another transformation of scale—this process played a crucial role in stabilizing global capitalism after 1945, a period in which the us could afford to power the whole global non-communist economy by running trade deficits. In Paris, the campaign to stop the Left Bank Expressway and the destruction of traditional neighbourhoods by the invading ‘high-rise giants’ such as the Place d’Italie and Tour Montparnasse helped animate the larger dynamics of the 68 uprising. It was in this context that Henri Lefebvre wrote The Urban Revolution, which predicted not only that urbanization was central to the survival of capitalism and therefore bound to become a crucial focus of political and class struggle, but that it was obliterating step by step the distinctions between town and country through the production of integrated spaces across national territory, if not beyond. The right to the city had to mean the right to command the whole urban process, which was increasingly dominating the countryside through phenomena ranging from agribusiness to second homes and rural tourism. The current crisis, with vicious local repercussions on urban life and infrastructures, also threatens the whole architecture of the global financial system and may trigger a major recession to boot. The parallels with the 1970s are uncanny—including the immediate easy-money response of the Federal Reserve in 2007–08, which will almost certainly generate strong currents of uncontrollable inflation, if not stagflation, in the not too distant future. However, the situation is far more complex now, and it is an open question whether China can compensate for a serious crash in the United States; even in the prc the pace of urbanization seems to be slowing down. The financial system is also more tightly coupled than it ever was before. Computer-driven split-second trading always threatens to create a great divergence in the market—it is already producing incredible volatility in stock trading—that will precipitate a massive crisis, requiring a total re-think of how finance capital and money markets work, including their relation to urbanization. Though this description was written in 1872, it applies directly to contemporary urban development in much of Asia—Delhi, Seoul, Mumbai—as well as gentrification in New York. A process of displacement and what I call ‘accumulation by dispossession’ lie at the core of urbanization under capitalism. It is the mirror-image of capital absorption through urban redevelopment, and is giving rise to numerous conflicts over the capture of valuable land from low-income populations that may have lived there for many years. 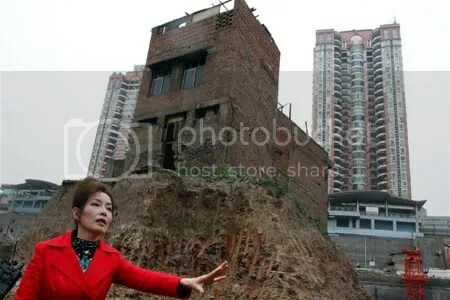 The "nail house" - so called because it refused to be hammered down - had been isolated in a huge construction pit after other households agreed to move. The developers won in the end. Mrs Wuping demanded that she be given a comparable space in the new development and refused the small payment offered. the usual response to which is brutal repression by the Communist party. In the prc it is often populations on the rural margins who are displaced, illustrating the significance of Lefebvre’s argument, presciently laid out in the 1960s, that the clear distinction which once existed between the urban and the rural is gradually fading into a set of porous spaces of uneven geographical development, under the hegemonic command of capital and the state. This is also the case in India, where the central and state governments now favour the establishment of Special Economic Zones—ostensibly for industrial development, though most of the land is designated for urbanization. This policy has led to pitched battles against agricultural producers, the grossest of which was the massacre at Nandigram in West Bengal in March 2007, orchestrated by the state’s Marxist government. Intent on opening up terrain for the Salim Group, an Indonesian conglomerate, the ruling cpi(m) sent armed police to disperse protesting villagers; at least 14 were shot dead and dozens wounded. Private property rights in this case provided no protection. What of the seemingly progressive proposal to award private-property rights to squatter populations, providing them with assets that will permit them to leave poverty behind? Such a scheme is now being mooted for Rio’s favelas, for example. The problem is that the poor, beset with income insecurity and frequent financial difficulties, can easily be persuaded to trade in that asset for a relatively low cash payment. The rich typically refuse to give up their valued assets at any price, which is why Moses could take a meat axe to the low-income Bronx but not to affluent Park Avenue. The lasting effect of Margaret Thatcher’s privatization of social housing in Britain has been to create a rent and price structure throughout metropolitan London that precludes lower-income and even middle-class people from access to accommodation anywhere near the urban centre. I wager that within fifteen years, if present trends continue, all those hillsides in Rio now occupied by favelas will be covered by high-rise condominiums with fabulous views over the idyllic bay, while the erstwhile favela dwellers will have been filtered off into some remote periphery. Urbanization, we may conclude, has played a crucial role in the absorption of capital surpluses, at ever increasing geographical scales, but at the price of burgeoning processes of creative destruction that have dispossessed the masses of any right to the city whatsoever. The planet as building site collides with the ‘planet of slums’. Periodically this ends in revolt, as in Paris in 1871 or the us after the assassination of Martin Luther King in 1968. If, as seems likely, fiscal difficulties mount and the hitherto successful neoliberal, postmodernist and consumerist phase of capitalist surplus-absorption through urbanization is at an end and a broader crisis ensues, then the question arises: where is our 68 or, even more dramatically, our version of the Commune? As with the financial system, the answer is bound to be much more complex precisely because the urban process is now global in scope. Signs of rebellion are everywhere: the unrest in China and India is chronic, civil wars rage in Africa, Latin America is in ferment. Any of these revolts could become contagious. Unlike the fiscal system, however, the urban and peri-urban social movements of opposition, of which there are many around the world, are not tightly coupled; indeed most have no connection to each other. If they somehow did come together, what should they demand? The answer to the last question is simple enough in principle: greater democratic control over the production and utilization of the surplus. Since the urban process is a major channel of surplus use, establishing democratic management over its urban deployment constitutes the right to the city. Throughout capitalist history, some of the surplus value has been taxed, and in social-democratic phases the proportion at the state’s disposal rose significantly. The neoliberal project over the last thirty years has been oriented towards privatizing that control. The data for all oecd countries show, however, that the state’s portion of gross output has been roughly constant since the 1970s. The main achievement of the neoliberal assault, then, has been to prevent the public share from expanding as it did in the 1960s. Neoliberalism has also created new systems of governance that integrate state and corporate interests, and through the application of money power, it has ensured that the disbursement of the surplus through the state apparatus favours corporate capital and the upper classes in shaping the urban process. Raising the proportion of the surplus held by the state will only have a positive impact if the state itself is brought back under democratic control. We have yet, however, to see a coherent opposition to these developments in the twenty-first century. There are, of course, already a great many diverse social movements focusing on the urban question—from India and Brazil to China, Spain, Argentina and the United States. In 2001, a City Statute was inserted into the Brazilian Constitution, after pressure from social movements, to recognize the collective right to the city. In the us, there have been calls for much of the $700 billion bail-out for financial institutions to be diverted into a Reconstruction Bank, which would help prevent foreclosures and fund efforts at neighbourhood revitalization and infrastructural renewal at municipal level. The urban crisis that is affecting millions would then be prioritized over the needs of big investors and financiers. Unfortunately the social movements are not strong enough or sufficiently mobilized to force through this solution. Nor have these movements yet converged on the singular aim of gaining greater control over the uses of the surplus—let alone over the conditions of its production. Robert Park, On Social Control and Collective Behavior, Chicago 1967, p. 3. For a fuller account, see David Harvey, Paris, Capital of Modernity, New York 2003. Robert Moses, ‘What Happened to Haussmann?’, Architectural Forum, vol. 77 (July 1942), pp. 57–66. Henri Lefebvre, The Urban Revolution, Minneapolis 2003; and Writings on Cities, Oxford 1996. Hilde Nafstad et al., ‘Ideology and Power: The Influence of Current Neoliberalism in Society’, Journal of Community and Applied Social Psychology, vol. 17, no. 4 (July 2007), pp. 313–27. Mike Davis, City of Quartz: Excavating the Future in Los Angeles, London and New York 1990. Marcello Balbo, ‘Urban Planning and the Fragmented City of Developing Countries’, Third World Planning Review, vol. 15, no. 1 (1993), pp. 23–35. Friedrich Engels, The Housing Question, New York 1935, pp. 74–7. Engels, Housing Question, p. 23. Harvey, The New Imperialism, Oxford 2003, chapter 4. Usha Ramanathan, ‘Illegality and the Urban Poor’, Economic and Political Weekly, 22 July 2006; Rakesh Shukla, ‘Rights of the Poor: An Overview of Supreme Court’, Economic and Political Weekly, 2 September 2006. Kelo v. New London, ct, decided on 23 June 2005 in case 545 us 469 (2005). Much of this thinking follows the work of Hernando de Soto, The Mystery of Capital: Why Capitalism Triumphs in the West and Fails Everywhere Else, New York 2000; see the critical examination by Timothy Mitchell, ‘The Work of Economics: How a Discipline Makes its World’, Archives Européennes de Sociologie, vol. 46, no. 2 (August 2005), pp. 297–320. Mike Davis, Planet of Slums, London and New York 2006.
 oecd Factbook 2008: Economic, Environmental and Social Statistics, Paris 2008, p. 225. Edésio Fernandes, ‘Constructing the “Right to the City” in Brazil’, Social and Legal Studies, vol. 16, no. 2 (June 2007), pp. 201–19. The ransom demand is a means of “reacting to the toxic waste that has been continually dumped on the shores of our country for nearly 20 years”, Januna Ali Jama, a spokesman for the pirates, based in the semi-autonomous region of Puntland, said. The pirates are holding the MV Faina, a Ukrainian ship carrying tanks and military hardware, off Somalia’s northern coast. According to the International Maritime Bureau, 61 attacks by pirates have been reported since the start of the year. While money is the primary objective of the hijackings, claims of the continued environmental destruction off Somalia’s coast have been largely ignored by the regions’s maritime authorities. Ahmedou Ould-Abdallah, the UN envoy for Somalia confirmed to Al Jazeera the world body has “reliable information” that European and Asian companies are dumping toxic waste, including nuclear waste, off the Somali coastline. But evidence of such practices literally appeared on the beaches of northern Somalia when the tsunami of 2004 hit the country. 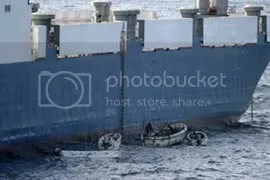 Nick Nuttall, a UNEP spokesman, told Al Jazeera that when the barrels were smashed open by the force of the waves, the containers exposed a “frightening activity” that has been going on for more than decade. “Somalia has been used as a dumping ground for hazardous waste starting in the early 1990s, and continuing through the civil war there,” he said. “European companies found it to be very cheap to get rid of the waste, costing as little as $2.50 a tonne, where waste disposal costs in Europe are something like $1000 a tonne. Nuttall also said that since the containers came ashore, hundreds of residents have fallen ill, suffering from mouth and abdominal bleeding, skin infections and other ailments. “We [the UNEP] had planned to do a proper, in-depth scientific assessment on the magnitude of the problem. But because of the high levels of insecurity onshore and off the Somali coast, we are unable to carry out an accurate assessment of the extent of the problem,” he said. However, Ould-Abdallah claims the practice still continues. “What is most alarming here is that nuclear waste is being dumped. Radioactive uranium waste that is potentially killing Somalis and completely destroying the ocean,” he said. Ould-Abdallah declined to name which companies are involved in waste dumping, citing legal reasons. But he did say the practice helps fuel the 18-year-old civil war in Somalia as companies are paying Somali government ministers to dump their waste, or to secure licences and contracts. Ould-Abdallah said there are ethical questions to be considered because the companies are negotiating contracts with a government that is largely divided along tribal lines. In 1992, a contract to secure the dumping of toxic waste was made by Swiss and Italian shipping firms Achair Partners and Progresso, with Nur Elmi Osman, a former official appointed to the government of Ali Mahdi Mohamed, one of many militia leaders involved in the ousting of Mohamed Siad Barre, Somalia’s former president. At the request of the Swiss and Italian governments, UNEP investigated the matter. Osman also denied signing any contract. However, Mustafa Tolba, the former UNEP executive director, told Al Jazeera that he discovered the firms were set up as fictitious companies by larger industrial firms to dispose of hazardous waste. “At the time, it felt like we were dealing with the Mafia, or some sort of organised crime group, possibly working with these industrial firms,” he said. The Italian mafia controls an estimated 30 per cent of Italy’s waste disposal companies, including those that deal with toxic waste. In 1998, Famiglia Cristiana, an Italian weekly magazine, claimed that although most of the waste-dumping took place after the start of the civil war in 1991, the activity actually began as early as 1989 under the Barre government. Beyond the ethical question of trying to secure a hazardous waste agreement in an unstable country like Somalia, the alleged attempt by Swiss and Italian firms to dump waste in Somalia would violate international treaties to which both countries are signatories. Switzerland and Italy signed and ratified the Basel Convention on the Control of Transboundary Movements of Hazardous Wastes and their Disposal, which came into force in 1992. EU member states, as well as 168 other countries have also signed the agreement. The convention prohibits waste trade between countries that have signed the convention, as well as countries that have not signed the accord unless a bilateral agreement had been negotiated. It is also prohibits the shipping of hazardous waste to a war zone. Abdi Ismail Samatar, professor of Geography at the University of Minnesota, told Al Jazeera that because an international coalition of warships has been deployed to the Gulf of Aden, the alleged dumping of waste must have been observed. “If these acts are continuing, then surely they must have been seen by someone involved in maritime operations,” he said. Mohammed Gure, chairman of the Somalia Concern Group, said that the social and environmental consequences will be felt for decades. Ould-Abdallah said piracy will not prevent waste dumping. “The intentions of these pirates are not concerned with protecting their environment,” he said.